Welcome to 1 item, 3 ways! A post that will allow me to flex my creativity with one item, while also trying to inspire you to play with prints. We all know I love a good leopard print. 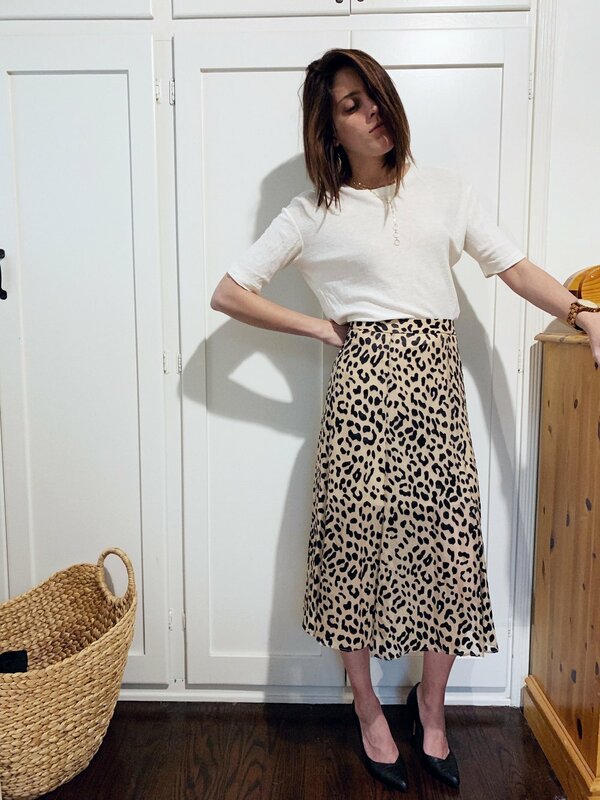 Ahem, my Sezane Helene Leopard heels. So when I found this Alice&Olivia leopard skirt on Poshmark, I knew it had to be mine. It was out there just enough, that my friends were pretty split on if I should get it. And when that happens, I usually end up with the item. I let the item sit as a “liked” item for a few weeks before I even showed them. Thinking that if I still loved it a few weeks later and it was still available, maybe it was meant to be. And I am oh so glad its mine. I’ve been reading a lot about the Spring and Summer trends to watch this season. Every publication is just slightly different on what to watch for, but a few trends reappear multiple times. Animal print included. Animal print never really seems to “go out of style”. It’s a classic that is here to stay. And one fun print to play around with. So here I have 3 ways to style animal print. More specifically, a leopard skirt. 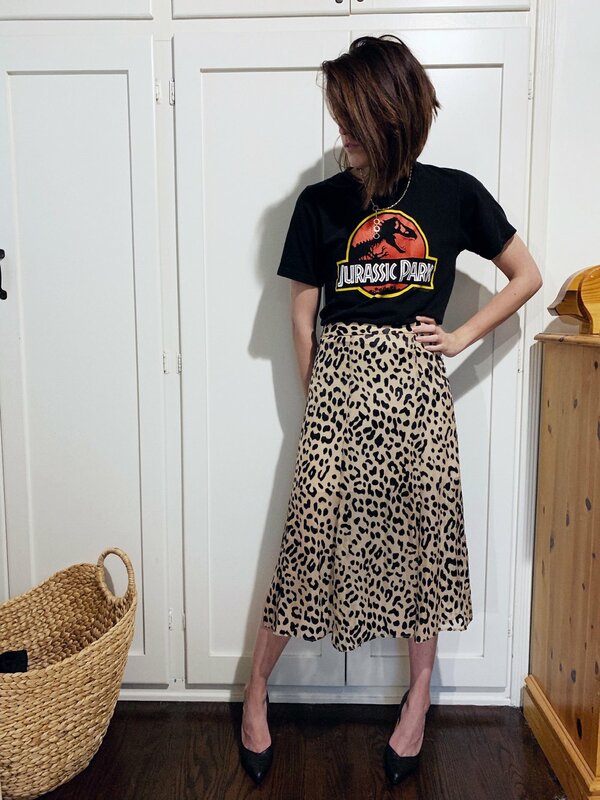 My beautiful friend over at Goblin Shark sent me this t-shirt for my birthday after she oh-so casually mentioned she had 2 jurassic park tees. I immediately told her if she ever needed to re-home one, my home was open. And so here it is. I love that this graphic tee works so well with this skirt. This combination works because the graphic is simple, and the main color of the shirt (black) draws from the black in the skirt. Here, I added my favorite Cuyana coat I bought last year. The classic style and coloring matches almost everything. When I saw this chunky knit sweater vest on Poshmark, I knew immediately I wanted to style it with this skirt for spring. Had I bought either of these pieces when I thought that? No. But seeing them together in real life, makes me so happy and exactly what I envisioned. The oversized can also work well with a skirt, but you have to make sure to tuck in a corner, in order to not lose shape. Perfect for a spring night. To keep it simple, yet classy you can never go wrong with an off white tee and a leopard skirt. I elevated that look with a simple linen tee. It adds a little more texture than a regular cotton tee, but still just as easy. Its the easiest style to add a coat and go when it might get a little chilly. I have a million more ways I could style this. But I’ll save that for another time. What would be your favorite way of styling a fun leopard print? Let me know in the comments below!